This past Saturday, The New York Times ran an interesting and hilarious article about a "pizza war" in midtown between 2 Bros Pizza and a neighboring Indian lunch joint that also sells pizza (I've put a link to the article on my Facebook page). Since 2 Bros Pizza has been on my radar for a few months as a place to for a quick and cheap posting, now was a great time spend a few minutes to schlep across town to Sixth Avenue and see the war for myself. If you work in Midtown then you know that dollar-per-slice pizza joints have been sprouting like weeds. 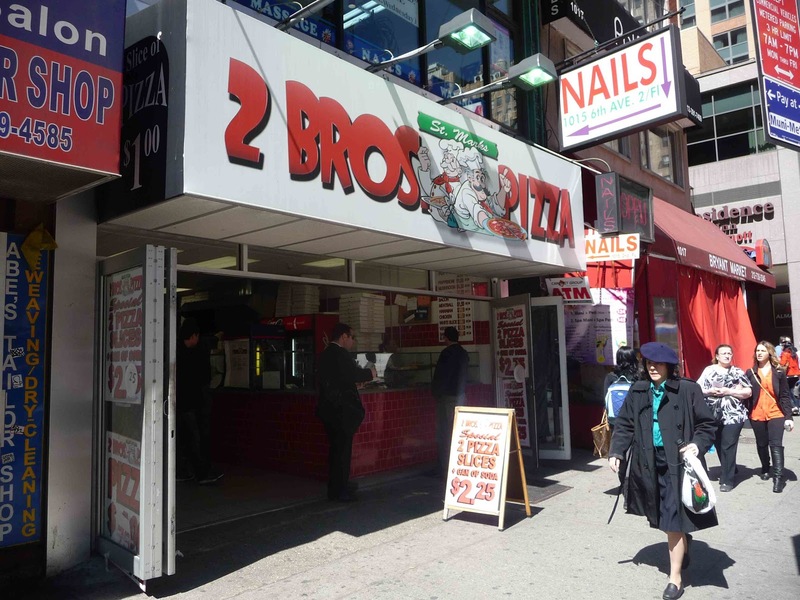 2 Bros Pizza, which pioneered this trend from its home in the East Village, where poor college students live and frequent has been expanding lately. One such expansion was right next door to Bombay Fast Food, and, before you know it, the price was no longer one meager dollar, but 75 cents. Yup seventy five cents. Three quarters. With the average slice these days hovering around $2.50, one might think that you can't go wrong. Not so. With prices so cheap that a homeless drunk can afford to eat here, you know what you're in for. Walking into the 2 Bros Pizza on 38th Street is like walking into the Port Authority Bus Terminal in 1989. Dirty, gray, and tiled like a public men's bathroom. The prices are so cheap that there's a line of people twenty deep shuffling along the counter to get their slices, so it's also kind of like being in a church basement soup kitchen. 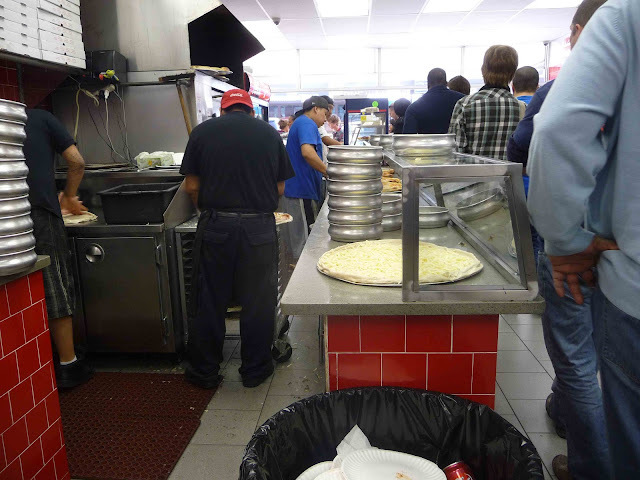 The workers hurry to place the orders, making three pies at a time. 2 Bros slices are only two-thirds the size of the average NYC slice, but at one-third the cost, you should theoretically still be getting a bargain. This math only works out, though, if you end up wanting to eat what you just paid for. And that's not likely. What you see above is the slice they gave me. Gloppy, uneven cheese, not fully cooked, and not even fully covered. 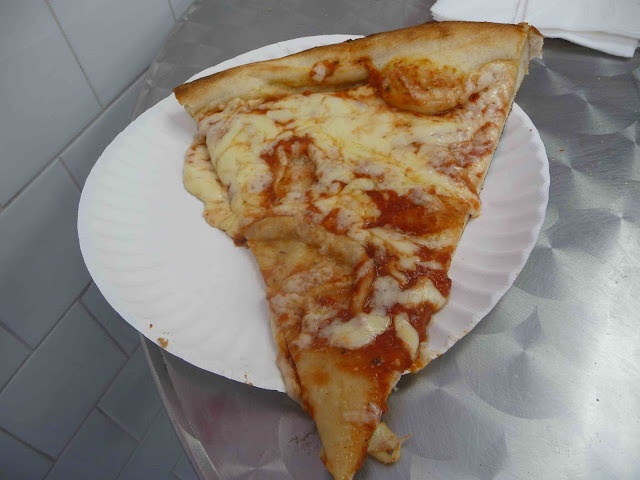 It's the kind of slice that even looks like it cost seventy-five cents too much. With the speed at which 2 Bros Pizza is cranking out pies, this was about as fresh a slice as one can get. And even though I waited a few minutes to pay and snap a picture before biting in, 2 Bros uses cheese so cheap that it was like wrapping my lips around an oily lava flow. I still have the burn. The lady standing at the tall table next to me was using up her stack of napkins dabbing up the grease (along with most of her sauce), a disgusted grimace planted firmly across her face. Meanwhile, the pizza sauce is so sweet, so over-sugared, that it was like tomato frosting. And the crust, which actually was not terrible, was too soft and undercooked. I got through half the slice and left. It just wasn't worth being there any longer. Leaving and going next door to Bombay Fast Food wasn't impressive either. Bombay is basically a bodega that sells pizza and Indian food along with beer and lotto tickets. India isn't known for its pizza chefs and Bombay isn't going out of its way to prove the conventional wisdom wrong. Their pizza has a dry, grainy crust, absolutely flavorless sauce and cheese, and their slice was somehow even smaller than the 2 Bros slice. But I'll give them this. It actually looked like pizza instead of triangular-shaped vomit. Still... I donated it to the landfill and went to Starbucks. So who wins? Neither. They're both awful and I'll never return. The only difference between giving your 75 cents to either of these establishments and giving it to a panhandler is that the panhandler doesn't hand you something you end up throwing out. My advice is to walk a few blocks further and spend a few bucks more. It'll be $2 well spent.